Blondie and Brownie: One Week Until Our Book Pubs! Book signing and Midtown Lunch meet and greet with our awesome photographers, Donny Tsang and Clay Williams. Book signing and panel discussion with vendors from the book as part of the Downtown Literary Festival. Wednesday, April 17, 2013, 6:30 - 8:30 p.m.
"Tweeting and Eating: How Social Media has Changed the Way We Eat"
Facebook, Twitter, Instagram, Yelp...never before has it been easier to hunt down delicious food and share your own discoveries. This panel discussion hosted by Alexandra Penfold and Siobhan Wallace (that's us! 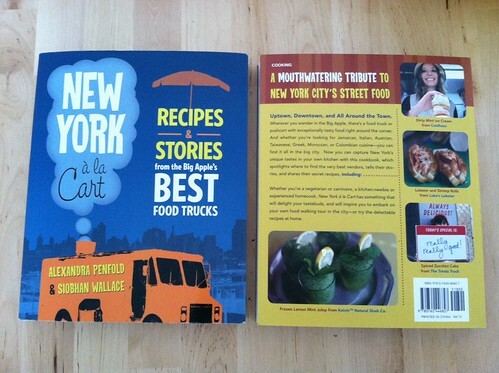 ), co-authors of New York à la Cart: Recipes and Stories from the Big Apple's Best Food Trucks explores the intersection of food and social media, the rise of online food communities and the explosion of New York's food truck scene. Guest panelists include: Thomas DeGeest, owner and founder of Wafels & Dinges Belgian Waffle truck, Ed Levine, founder of SeriousEats.com, Chef Adam Sobel, owner and founder of The Cinnamon Snail Vegan Truck, and Melissa Zhang, Ruskin International Communications Senior Account Executive. Book signing and panel featuring vendors from the book. Stay tuned for more info about signings, events and some other special things we have in the works! Awesome!!! I just put the event on the 17th in my calendar!! baught your book in local barnes and nobles (stamford ct) today, I am really enjoying it!. Will arrange tour by the best spots!